As a new criminal gang backed by Cadmus-provided technology plagues National City, Kara gets Mon-El a job an internship at CatCo and James Olsen makes a fateful decision regarding taking an active role in protecting the city. Even allowing for her being on-hand to offer help, it still seems ridiculously short-sighted on Kara's part to send Mon-El out into an officer environment without teaching him basic things such as how a phone works. Why not have J'onn fill in for either Kara or Supergirl at the party? He's done it before and the DEO has a vested interest in monitoring Lena Luthor's fundraiser with all available resources if they believe the robbers might attack it. Katie McGrath has her finest turn yet as Lena Luthor. Putting her in a heroic role in this episode and pairing her with Jeremy Jordan, however briefly, draws the character out of her infamous brother's shadow in a way the show hasn't managed until now. Talking of Jeremy Jordan, the chemistry between him and Mehcad Brooks is phenomenal. Both actors haven't been served well by the scripts for this season so far so it is gratifying that they both get great material this weak and are allowed to play off one another so well. Finally, Chyler Leigh does delivers a credible performance as a confused Alex begins to consider her feelings for Maggie and the idea that there's a part of her she may have repressed in her years of seeking a perfect life according to the terms of her job and her role as a sister. The various fight scenes in this episode are much better choreographed than usual. The sequence in which James evacuates the building is particularly impressive. The special effects for the sequence in which Kara rescues the police officer from the car thrown into the stratosphere are great. There's wonderful editing in the scene where Kara and Supergirl must both be at Lena Luthor's party. Kara is shown using her heat vision to cut Mon-El's hair for his first day at work. In the comics and Superman: The Animated Series, it has been established that Kryptonians use their heat-vision to facilitate hair-removal since ordinary Earth tools couldn't get the job done. Superman has been depicted shaving using his heat vision reflected off a mirror and Power Girl has been shown shaving her legs with her heat vision. Kara sets up a fake identity for Mon-El - Mike Matthews. This conforms to the most frequent standards for superhero secret-identities in classic comic books, where the male heroes' first and last names were both men's names (i.e. Clark Kent, Bruce Wayne, Hal Jordan, Peter Parker) or alliterative (i.e. Clark Kent, Peter Parker, Matt Murdock, Reed Richards, Bruce Banner) . While not identified by name, the criminal gang depicted in this episode uses a similar modus operandi to the comic-book organization known as Intergang. Created by Jack Kirby and first appearing in Superman's Pal Jimmy Olsen #133 (October 1970), Intergang was a criminal organization that used highly-advanced alien technology to commit crimes in Metropolis. The rank and file members of Intergang were only interested in making money and were manipulated towards other ends by the true powers behind the organization. In the case of the original comics, this true power was revealed to be the evil New Gods on the alien world of Apokolips. In the case of the DCTVU, the true power is Cadmus. The idea of Jimmy Olsen operating as a costumed crime-fighter is not a new one. Numerous Silver Age stories involved Jimmy Olsen temporarily acquiring super powers and trying to use them to help out Superman or trying to operate as an undercover agent or powerless crime-fighter. In one of the more prominent cases, Jimmy gained stretching powers and was made an honorary member of the Legion of Superheroes as Elastic Lad. He also teamed with Superman in the Bottle City of Kandor, where they adopted the aliases of Nightwing and Flamebird. Kara refers to the operation to have herself and Supergirl show up in the same place as Operation Doubtfire. This is a reference to the Robin Williams comedy Mrs. Doubtfire and the climax of the movie, in which an actor who masqueraded as an old woman in order to spend time with his kids after losing custody, must balance dinner with his former family in his nanny identity and dinner with a producer as himself at the same restaurant at the same time. An Anndrannian Photon Cannon is an electromagnetic weapon which emits phased moun particles. According to Winn, a fully-charged one could have unpredictable destructive effects on even Supergirl. Even with a diminished-charge, an Anndrannian Photo Cannon was capable of knocking Supergirl out of the air and the beam fired by it was able to hold back one of Supergirl's heat-vision blasts. Supergirl mentions one weapon - Pythrarian magma bombs - and identifies it as being more advanced than any weapon on Krypton. Winn thinks a tracking algorithm might be able to locate the Anndrannian Photon Cannon by searching for the unique radiation signature left on Supergirl's suit. One of the other weapons used by the gang is an gun capable of controlling gravity. 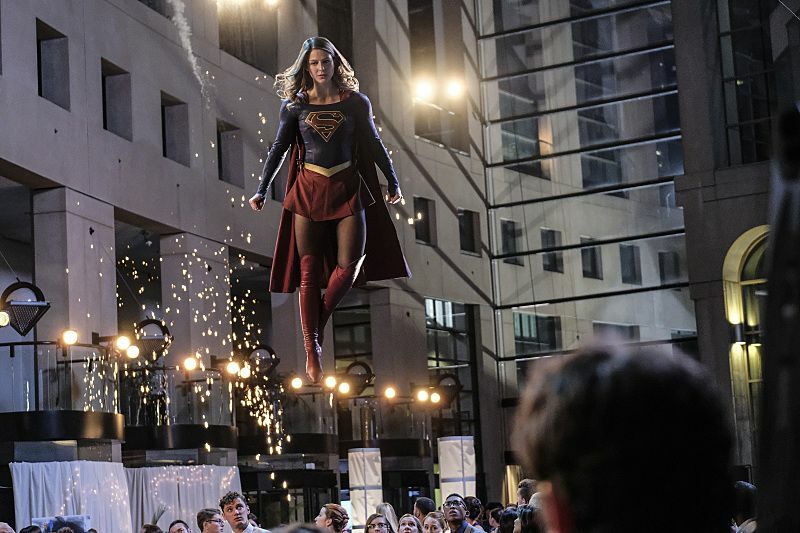 It is capable of slamming Supergirl to the ground while she is hovering in the air and throwing a police car upward with enough force that the car is seen icing over and the police officer inside is clearly having trouble breathing. Alex says the DEO is analyzing thermal residue to look for any electromagnetic components to the alien weapons so they can devise a counter-measure. The final gun used by Mr. Miner has enough power to disintegrate the side of a large building. It's beam is also powerful enough to push back Supergirl's heat vision. Lena Luthor has a Black Body Field Generator set up under the bandstand at her party. When at equilibrium with the alien weapons, the Field Generator will absorb the electromagnetic radiation of the weapons and shut them down. It fails to function, however, due to the frequency and wavelength being a match. It is fixed once she and Winn do something to the induction coil. The Cadmus Doctor uses some manner of radio device to send a signal to Mr. Miner just before the signal kills him and his gang. Supergirl: You do know those bullets aren't going to work on me, right? Mr. Miner (pulling off his ski-mask as he raises a high-tech gun) I'm glad I didn't bring any bullets! Reporter: I don't know about the rest of you, but I sure as hell would feel a lot safer if I had one of those super-powered weapons on me to defend myself. Kara: That's not the solution! Reporter: Well then what is? The bad guys are running around everywhere with these high-tech weapons. I just think it's about time w good guys got some of our own. Kara: Alien guns are bad, no matter who controls them. Reporter: The Second Amendment gives us the right to bear arms. Even if those arms are ray guns! Kara: That's what Cadmus wants! They're the ones handing out these weapons. They want us to be afraid of each other. To not trust each other anymore? Reporter: Well, how do you know what Cadmus wants? Kara: ... I- I just do. Kara: This is your place of work! So when James gives you a task, you should be the one to complete it - not Miss Teschmacher! Kara: Wherever you are going with that, just... just don't. We are not on Daxam.... thank Rao! Alex: I just thought that we could go and have some fun. Keep each other company. Alex: Yes! Why? Why- what's wrong with that? Maggie: Nothing. It just... I think I read you wrong. Maggie: I - I didn't think you were into girls. Alex: No, I mean, no offense, Maggie. Maggie: No, I get it. You're not gay. Maggie: You'd be surprised how many gay women I hear that from. Miss Teschmacher: (panting) Mike, do you have protection? Mon-El: You mean like a sword? Kara: Oh God! Get it out of my ears! Ewww! James: My whole life I have been a sidekick. I have hidden behind my camera. All my best friends wear capes and they're heroes and they save people and I want to do something good for the world. And I feel like I've waited too long already. Winn... you found the work that you're supposed to do at The DEO. I haven't. Not here. But I feel like this is it. Winn: I hate to break it to you dude, but you don't have super powers. James: I know! But I can do this! We can do this. James; Yes. We. I mean, I have a black belt. And you're right - I don't have powers.You... you can make me a suit. You can build me a weapon. And together we can level the playing field. C'mon! Winn: Hmmm... no. No! I can't do it! Winn: There's a difference, okay?! She can fly! You're just.... tall. James: You know, watching my dad's camera get destroyed reminded me of something. He gave his life protecting this country. And if I do this, I can honor him. Winn: Or you can end up just like him. James: I'm going to continue to be that crazy guy with the baseball bat and the ski-mask. With or without you. Winn: James... guys like us.... we are here to give people information. Right? To fight with knowledge. There is no shame in that, man! You - you've got to think this through. You're going to get yourself killed. Supergirl: You like to take risks, don't you? When Corben was after you and now this - why? Lena: Well, you can't live in fear. You, more than anyone, must understand that? Time and again you risk everything to see justice done. Is it so hard to believe I feel the same way? Are you one those people who think there's no such thing as a good Luthor? Supergirl: I believe everyone should be judged on their own merits. Lena: Then judge me on mine. Alex: ... that maybe there's some truth to what you said. Alex: What you said. About me. Mike Matthews' social security number is 498-00-3145. Maggie Sawyer's girlfriend, first seen in 204, has dumped her as this episode opens. The camera that James Olsen's father gave him is destroyed during the gang's first attack. Anndrannians are an alien race with purple skin and fins. Kara says the weapons being used by this new criminal gang are more advanced than the weapons of Krypton. Lena Luthor says that Kara is her only real friend in National City. James says that a poll shows 63% of all people favor repealing The Alien Amnesty Act. James has a black-belt in some unidentified martial art. Alex identifies herself as an FBI agent when asked what her job is. Alex liked horror movies, science fairs and punk rock as a teenager. Kara preferred romantic comedies, N'Sync and didn't like science fairs as a teen.. The Cadmus Doctor refuses to go after The Luthors. She says that she has a son and daughter. Supergirl refers to Lena Luthor fighting John Corben in 201. Both Krypton and Daxam have dancing. All of the gang is killed by The Cadmus Doctor. Winn agrees to make a super-suit for James. James says he has a superhero name in mind but doesn't tell Winn what it is. Mon-El was fired from his internship. Alex confesses her attraction to Maggie Sawyer to Maggie. At the end of the episode, The Cadmus Doctor is revealed to be Lena and Lex Luthor's mother. An enjoyable episode that is more than the sum of its parts. The main plot with the Cadmus-backed robbers is fairly weak, as is the comedic plot of Mon-El failing to fit in at CatCo. Still, the effects used for the action-sequences and the direction of those sequences is top-notch. What makes this episode work as well as it does, however, is the excellent performances of the supporting cast and all the subplots involving Lena trying to prove herself to Supergirl, James trying to prove something to himself, Alex dealing with her newfound romantic feelings and Winn.